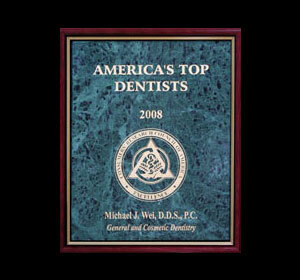 Manhattan Cosmetic Dentist Dr. Michael J. Wei is a Top New York City NYC dentist specializing in general, cosmetic and restorative dentistry including smile makeovers, invisalign braces, dental implants, porcelain crowns, porcelain veneers, cerinate lumineers, cosmetic tooth bondings, teeth whitening, snap-on smile and more. 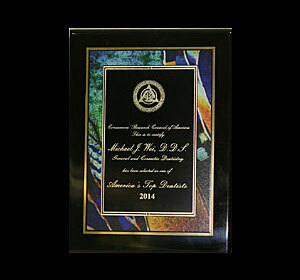 “I believe in treating my patients like I would treat my own family members. Caring for my patients and performing dentistry on them the way that I would want it performed on myself are of utmost importance. 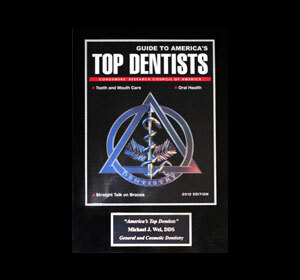 My mission is to provide top quality dentistry in a friendly and comfortable environment so that everyone can have healthy teeth and gums for a lifetime. 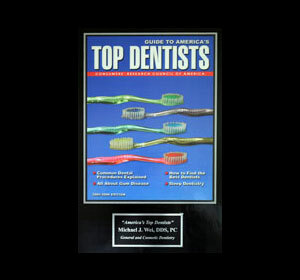 When you visit our Midtown Manhattan dental office, you’ll be treated with care by our friendly, welcoming team. We are here to help you every step of the way, from your first call to all follow-up and recall visits. 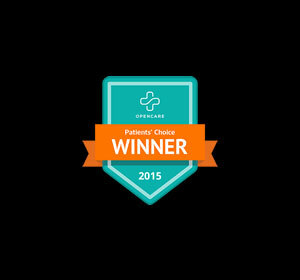 If you have questions about any aspect of your treatment plan or our easy financing plan, please ask. Call 212-982-4080 for your free consultation or appointment. 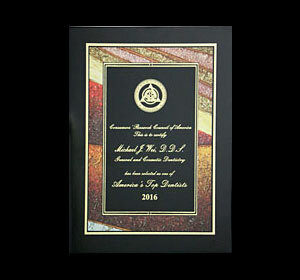 New York County Dental Society. 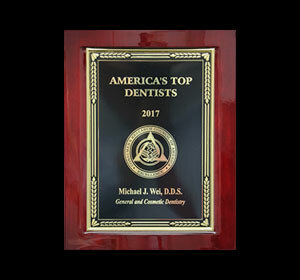 Dr. Michael J. Wei had the distinct honor of being voted one of America’s Top Dentists in 2005, 2006, 2007, 2008, 2009, 2010, 2011, 2012, 2013, 2014, 2015, 2016, 2017 and 2018 by the Consumer’s Research Council of America. Consumers’ Research Council of America is a private company that evaluates and compiles lists of America’s Top Professionals in various industries. 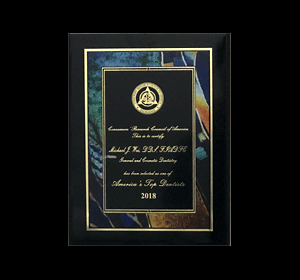 The selection process is based on a point value system that awards points for education, years in practice, and affiliations with professional associations. 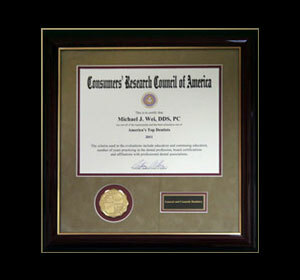 Consumers’ Research Council of America provides consumers’ information guides for professional services throughout America. It is their purpose to help educate and assist consumers in obtaining the finest professional services. They specialize in the healthcare, education, legal and financial industries. 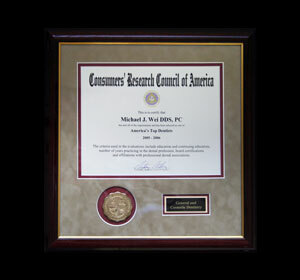 Consumers’ Research Council of America does not accept fees, donations, sponsorships or advertising from any individuals, professionals, corporations or associations. This policy was enacted to ensure an unbiased selection for the lists of America’s Best. 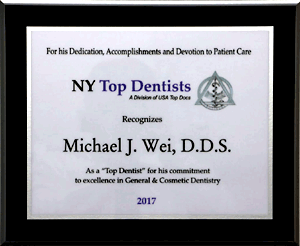 Dr. Michael J. Wei has been awarded New York’s Top Dentist award for 2016, 2017, & 2018! 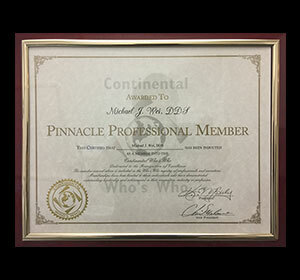 Dr. Michael J. Wei was awarded by Continental Who’s Who for being “Dedicated to the Recognition of Excellence” in 2017. 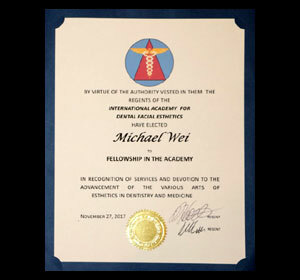 Dr. Michael J. Wei has been awarded the Fellowship in the International Academy for Dental Facial Esthetics in Novemeber 2017. 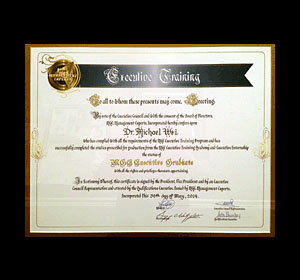 Dr. Michael J. Wei graduated from Rutgers University with a Bachelor of Science degree in Biology and a minor in Psychology in 1996. 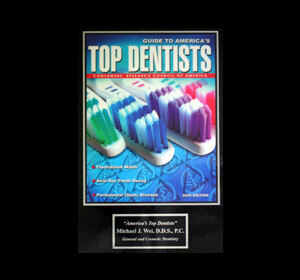 Then Dr. Wei completed his Doctorate of Dental Surgery (DDS) degree from New York University College of Dentistry in 2000. Soon after that, he received dual certificates in Advanced Education in General Dentistry (AEGD) at Columbia University School of Oral and Dental Surgery, and also completed a Fellowship at New York Presbyterian Hospital, both in 2001. 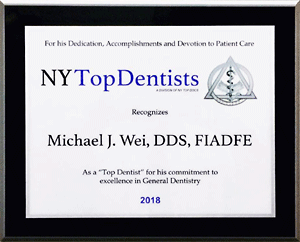 In September 2002, Dr. Wei opened his private dental practice in Gramercy Park Manhattan, and in April 2007 Dr. Wei moved his practice to Midtown Manhattan. 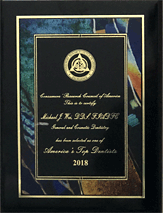 He has since continued his education with many annual postgraduate courses in restorative and cosmetic dentistry, including certifications as an Invisalign certified dentist in 2004 and Lumineers certified dentist in 2010. 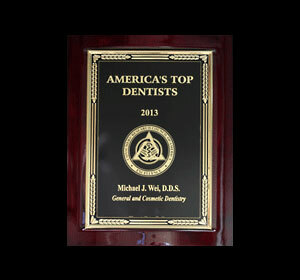 Dr. Wei spends his free time pursuing advanced dental education. 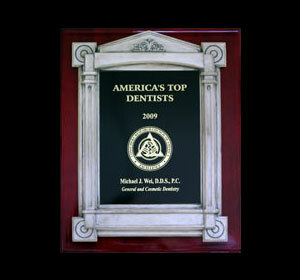 He is trained at some of the top dental institutions in the United States. 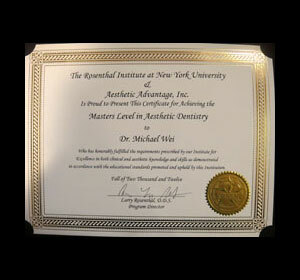 He has received advanced training and continued education at the world renowned Las Vegas Institute for Advanced Dental Studies (LVI) 2013 – 2014 and The Rosenthal Institute at New York University College of Dentistry Aesthetic Advantage, Inc. for completion of Level I in Fall 2011, Level II in Spring 2012, and Level III ( Masters Level Achievement in Aesthetic Dentistry) in Fall 2012, which are considered the top cosmetic dental institutes in the world. 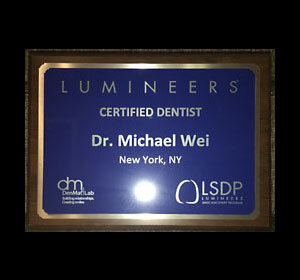 Dr.Wei is a lumineers certified dentist in 2010. 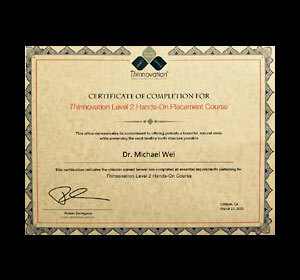 Dr. Wei completed Thinnovation Live Patient Placement of Lumineers courses in June 2015 at DenMat Education Headquarters in Lompoc, California. 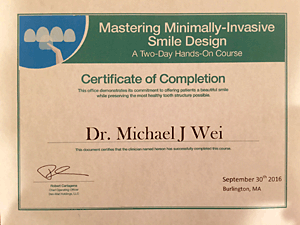 Dr.Wei also took numerous Thinnovation Lumineers Dentistry Hands-On courses Thinnovation: Mastering Minimally-Invasive Smile Design from 2010 – 2017. 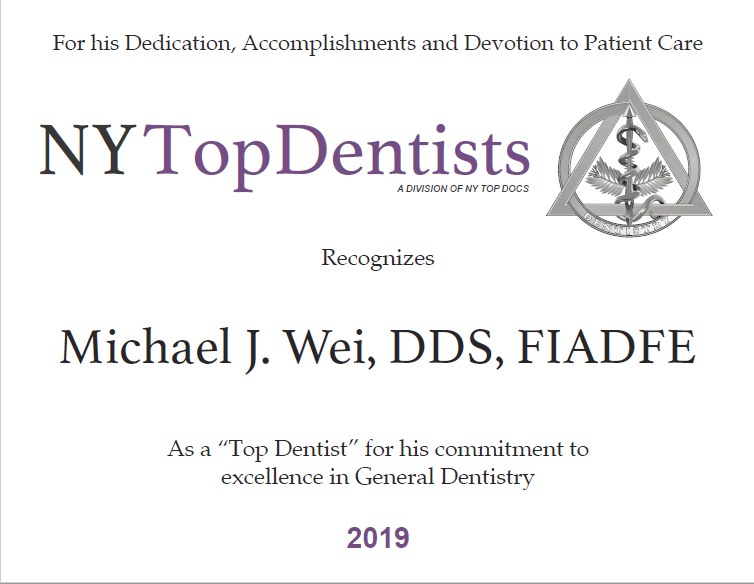 Dr. Wei completed the Full Mouth Reconstruction Course 2017 & 2018 in New York University College of Dentistry. He is experienced with many of the latest dental procedures and offers comprehensive care for a wide range of dental conditions. 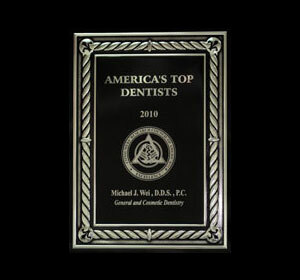 Dr. Wei continues to take continuing education courses, always surpassing the state license requirements. 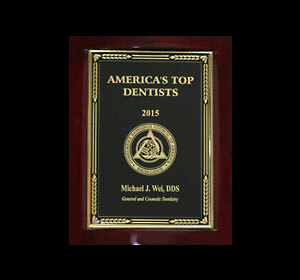 Dr. Wei maintain the highest levels of accreditation and pursue ongoing education to stay abreast of the latest trends in dentistry. 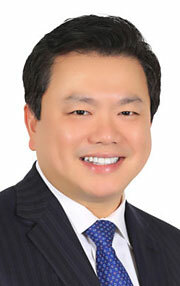 Dr.Wei has lectured on the national level on cosmetic dentistry. He currently is a clinical associate professor at New York University College of Dentistry in the Department of Full Mouth Reconstruction. He has a private practice in New York City, NY. Outside the office, Dr. Wei enjoys spending time with his family. He is married to his wife Angela and they have 3 children. His hobbies include traveling, reading and tennis. He is looking forward to being able to serve you as well as getting to know you.